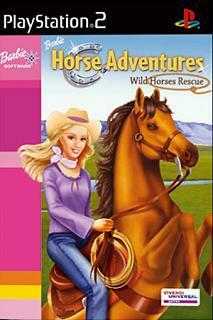 Girls help Barbie and her friends find the lost horses missing from the local riding school in the first Barbie game for the PlayStation 2 computer entertainment system and Xbox video game system from Microsoft. Girls join Barbie on an action-packed, 3D horse riding adventure as they ride through five stunning areas - jumping over fallen trees, crossing rickety bridges and avoiding other potential hazards throughout their quest. Girls can guide Barbie and her horse over thin cliff edges and logs in rivers, leading Barbie to dismount her horse and explore the trails on foot, even assisting Barbie to climb ledges and swing hand over hand along low branches.